The Bonneville is a retro classic motorcycle, featuring a parallel twin 4-stroke engine, first launched in 1959. What we see on roads today, are the third generation of Bonnevilles. 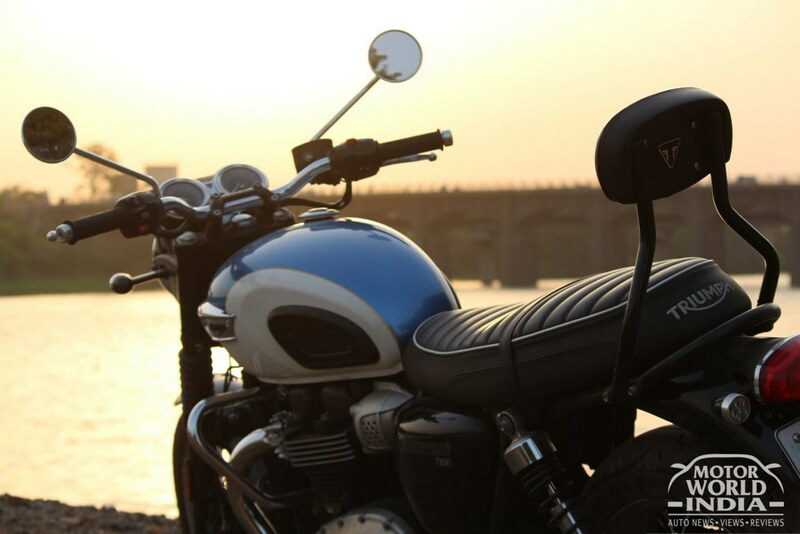 Today, Bonneville is not just a motorcycle; rather it is now a family of Modern Classics, which includes the Street Twin, T100, Bobber, T120 and the Thruxton R in India. The Street Twin and the T100 are the entry level Bonnevilles, while the T120 and the ThruxtonR are the top range models. Recently, we reviewed the Triumph Street Twin, the most affordable Bonneville which was targeted specifically towards the younger, modern, new-age bikers. 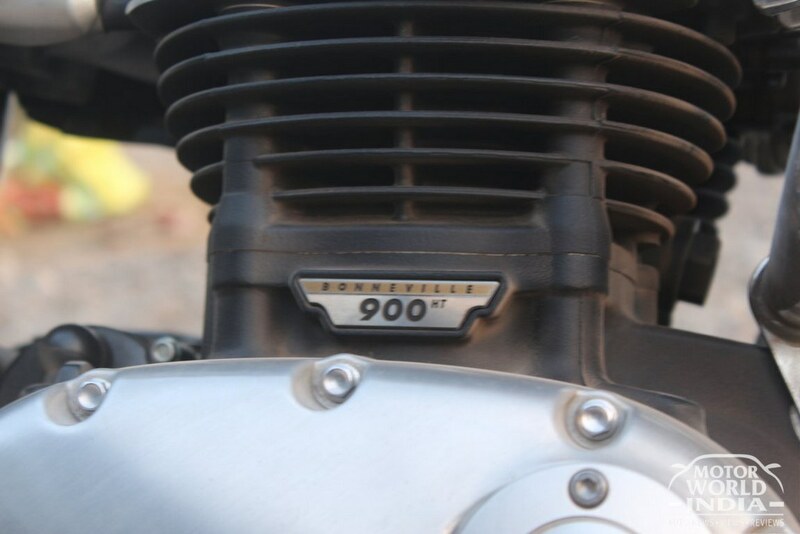 Since then, we have been riding the next stage offering from the Bonneville family, priced at Rs. 7,78,000/- Ex-factory. 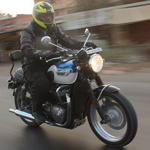 The Bonneville T100 is the next motorcycle we are reviewing. The T100, looks inspired from the original icon launched in 1959, carrying forward the classic old-school look on the exterior, with modern technology integrated under this Retro classic body. The T100 sits right between the Street-Twin and the T120, well… just not in terms of pricing, the T100 is basically a Street-Twin’s engine mounted on the frame of a T120. The T120 is superior to the T100 only in terms of the 1200cc HT engine, and gets heating grips and riding modes, and superior old school styling. The T100 carries forward the retro-chic styling that the T120 exemplifies. Least what we can say is…that the Bonneville T100 with it’s timeless style and signature touches from the original 1959 icon, looks stunning. The Bonneville T100 shares the same 900cc 8-valve liquid cooled parallel twin engine from the Street-Twin generating 55 PS of power, and 80 Nm of Torque. First thing you will notice, if you have ridden the Street-Twin and T100 in succession, is that the T100 is much more mature, and is not as aggressive as the Street-Twin. The power has been distributed all across the rev range, unlike the Street-Twin which had more torque delivered in the low and mid rpm range. The engine feel too, is completely different than the Street-Twin. The Bonneville T100’s engine is refined and silk smooth, power delivery is linear, and with the T120’s new frame setup, the result is a mature, smooth riding experience. We have ridden the T100 extensively, for approx 2000 kms, riding through City traffic, Highway rides and even a little bit of off-roading, to test the mettle of this Britisher, and boy… it’s consistent & rock solid, you could just keep on riding her for days..! Only thing you need to do is fuel it up! 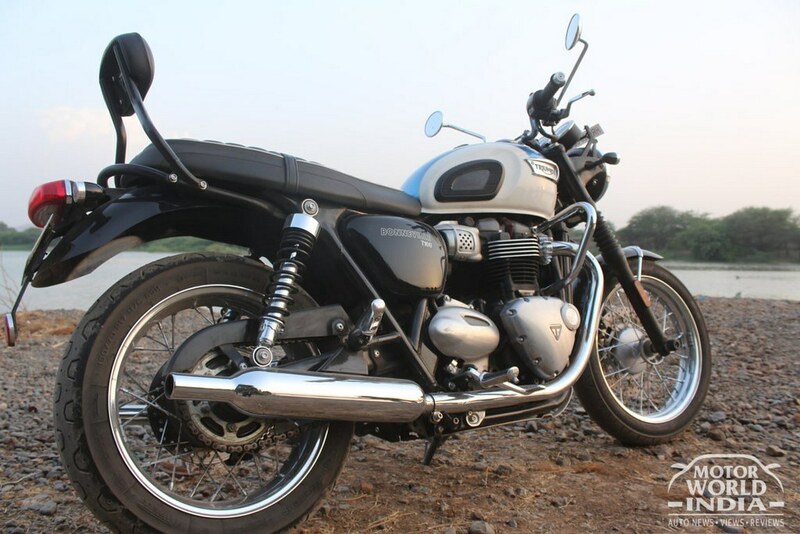 The Bonneville T100 delivered a mileage of approx 19-20 kmpl in our 2k kms test run. The Bonneville T100 shares the same 5-speed gearbox from the Street-Twin; gear shifts are soft and butter smooth. The torque assisted clutch system works excellent; allowing the rider to engage-disengage the clutch level with a single finger, something not seen even in 150cc bikes made in India. This 900cc high torque mill is fueled by an in-house developed EFI system, tuned to deliver torque throughout the rpm range, so all you need to do is twist that throttle, and just ride on. This mill is tuned to deliver its maximum power between 2750 rpm and 4750 rpm, ensuring that it suits the riding style of a modern retro classic, making the riding experience thrilling and engaging. Well, it does not mean, that it cannot deliver power in lower rpm’s…the gearing and the linear power delivery is such that the motorcycle can ride effortlessly at RPM’s as low as 1.5k in 4th or 5th gear without any knocking or resistance from the engine. The bike can run easily at 10-20 kmph in city traffic, and even cruise at 120-130 kmph with the same ease, without any murmurs from this mill. The only problem what we found is that, the engine gets pretty heated up in city traffic conditions, and the air vents blow the hot air out from beneath the tank, directed towards the footrest. This sometimes makes it very difficult to maintain the leg on the footrest. The Bonneville T100 is matured and a practical bike for a traveler soul, for those who like cruising on those state highways enjoying the landscapes and nature surrounding you, and explore those off-road trails, the roads not traveled upon. For someone who likes to whack the throttle out, go faster and faster, scrape your knees on corners, this is definitely not the bike for you. As said earlier, the Bonneville T100 shares the same chassis and suspension setup from its elder sibling, the T120. The new T100 has a shorter wheelbase, than the earlier generations, thanks to changes in the rake and trail of the bike. The new rake and trail design helps the T100 in maintaining its balance and composure. 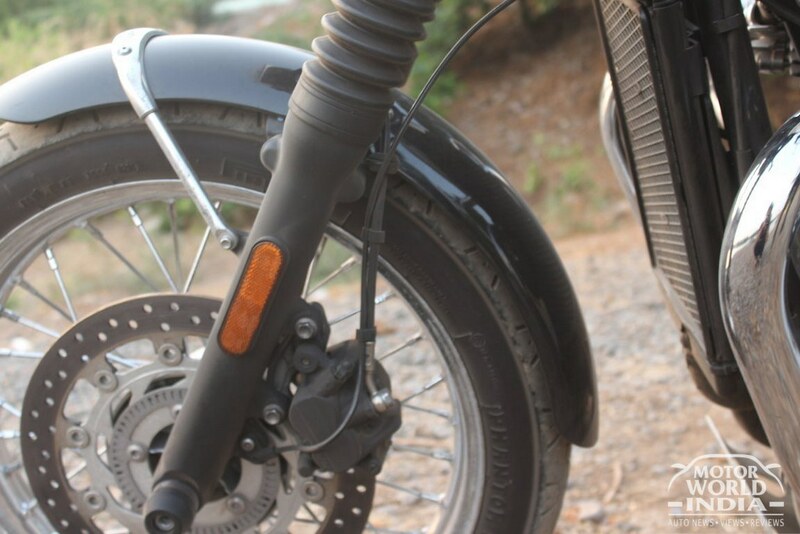 The T100 shares the same 41mm KYB cartridge forks setup on the front, and KYB twin shock absorbers with preload adjustments, and 120mm of travel on both the ends like as on the Street Twin, still it feels completely different. The shocks on the T100 are set on a softer setting, making the ride plush and comfortable. 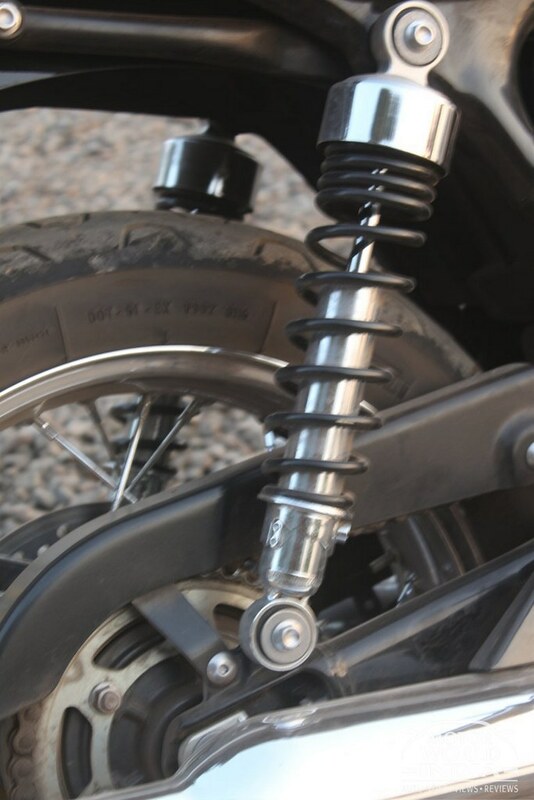 It handles small bumps and cratered roads well, without making the rider feel any jerks; even on big speed breakers, big potholes and off-roads, the suspension provide enough damping, performing effectively absorbing the shocks without any jerks to the rider’s back. This feel is completely different that what the Street Twin felt like.. it was stiff, back would hurt on bad roads..! So how can the same suspension setup feel different on different bikes? Well, read on to know about it! The Bonneville T100 comes home equipped with a 310 mm single disk Nissin brake setup on the front, and a 255 mm disk brake setup with floating Nissin calliper on the rear, which work brilliantly well providing great feedback and enough bite to stop this 213 kg motorcycle. Though the T100 misses out on the double disk brake setup in the front end like the T120, the braking performance delivered by the current setup seems adequate, and they work progressively according to the intensity of pressure applied. 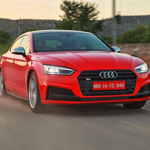 The brakes are assisted by a ABS setup, that works under the hoods silently, but comes in action when and where you need it. You can feel the ABS in action, as you can feel pulses on the brake levers, when applied with force or in emergency braking situations, otherwise, on normal conditions, one cannot make out if the bike has ABS or not. Along with ABS, Triumph has also equipped the T100 with a switchable Traction Control System, giving the T100 more power to explore unpaved roads and off-roads. The Bonneville T100 shares the same Pirelli Sportcomp tyres, like the Street-Twin. On the front is a 100/90-18 profile tyre while on the rear is a 150/80/17 profile tyre. These tyres are manufactured by Pirelli especially for Triumph’s Bonneville range of motorcycles, under an agreement between both the giants. The only problem with this is that, it becomes difficult to find replacement tyres from other manufacturers, due to Bonneville’s distinct tyre sizes. Finding replacement options other than the Pirelli Sportscomp tyres can be really cumbersome. These Pirelli tyres are mounted upon 32 spokes aluminium rims, and that’s the secret of the suspension working differently on the Street-Twin and the T100. You see, speciality of spokes wheels is that they are flexible and they too, work as shock absorbers. So when we hit a pothole on a spokes wheel vs magwheel, the jerk felt on the spokes wheel will be quite less compared to that felt on the magwheels. That’s the reason, why adventure and bikes meant for off-roading come with default spokes wheels. And that, my friends, is the reason why the KYB suspensions perform differently on Street-Twin and the T100. Overall the brakes, tyres, suspension and the chassis make the T100 very balanced and keep it anchored on all types of terrains. Cornering too, is fun on the T100, the 213 kgs of weight doesn’t really hold you back to dip into the corners. Though getting the bike leaned requires some efforts, due to the inverse tyres sizes, but once into a corner, the bike holds its ground well. Oh yeah, in corners, especially when you are leaning, use only the rear brakes, don’t ever press the front brakes, the bike will leave the corner and become straight, due to the fork movement, and you might end up in a pretty bad situation. Overall, the bike is nimble, easy to manoeuvre and has excellent braking power. The Bonneville T100 is a bike built for those looking for the old world feel. The T100 as a complete package looks fantastic, with retro classic being in its DNA. The T100 definitely carries the timeless styling and signature touches from the original motorcycle icon, the Triumph Bonneville, which was the first Bonneville launched in 1959. The T100 carries forward the classic chromed Twin Pea Shooter exhausts that deliver a deep rich tone, that of true British classic. A special mention of the Triumph design team, for the kind of attention they have paid on detailing and design of the T100. The T100 boasts a classical round headlight with halogen bulbs, unlike the DRL’s on the T120. The test bike we rode sported a shade of blue and white, and it definitely increased its retro appeal. 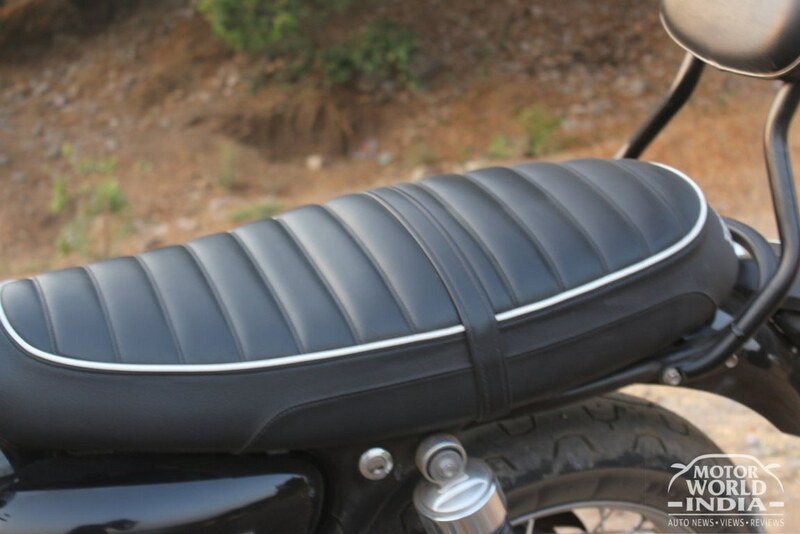 The 14.5 litres sculpted fuel tank with rubber tank pads and the Triumph logo look neat and attractive. The rubber tank pads not just add to the retro look, but are practical, as they protect the tank paint from scratches and damage caused unknowingly while riding it. The T100 has a range of approx 250-300 kms. The Bonneville T100 has a classic retro styled LED tail lamp, adding up to its looks, and giving the T100 a distinct personality, like no other Bonneville. Every Bonneville model, has its own distinct tail lamp design to differentiate one model from another. The engine casings too are buffed, and not powder-coated like on the Street Twin, again adding to the classic looks. 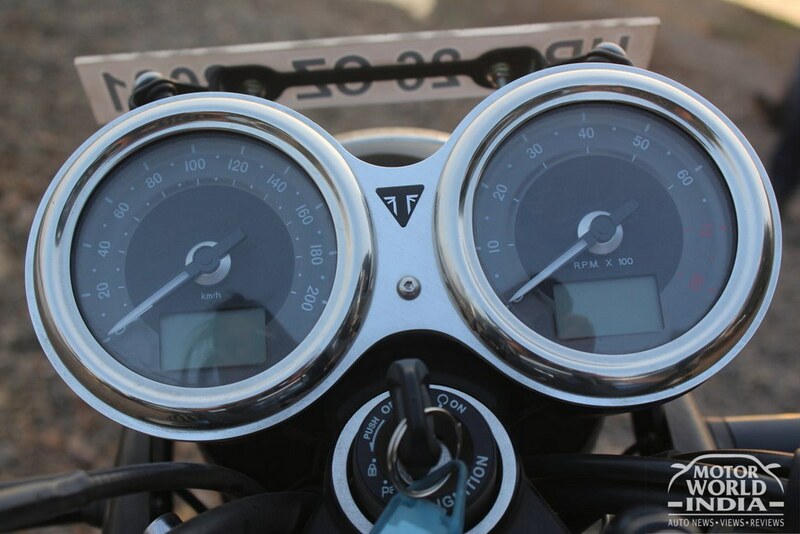 The instrument cluster on the T100 is a twin pod setup, with digital and analogue meters integrated in it. The twin instruments pods come covered in polished chrome bezels, and are backlit with white light. 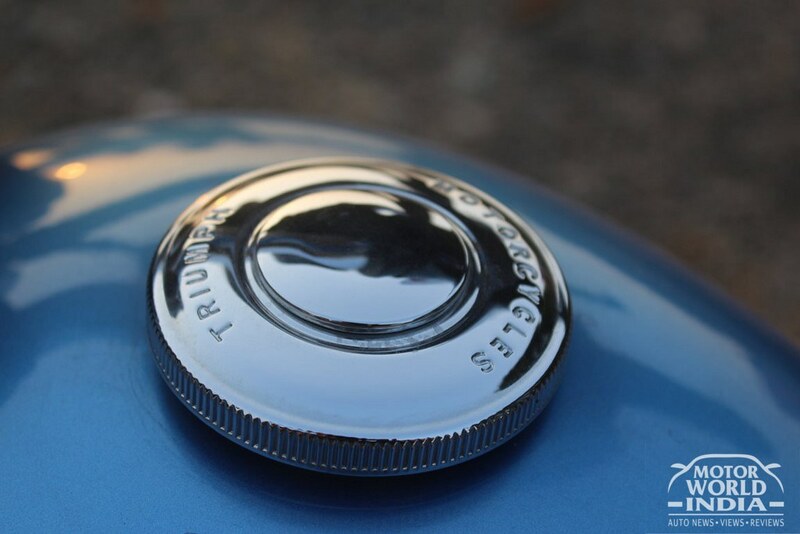 The fuel tank cap too is chrome, with ‘Triumph’ branding over. The seats are wide, nice and fat, again designed specifically to add to it’s retro look. The riding posture is upright thanks to the flat seat and centrally-positioned foot pegs. Overall, the bike is all polish and chrome, and looks stunningly beautiful. The twin pod instrument cluster houses an analogue tachometer and an analogue speedometer. Along with this, is LED display screens integrated into the instrument pods. This LED screen displays useful information like Fuel gauge, Distance to Empty, Real-Time mileage, Odo-meter, 2 trip meters and a gear position indicator. The switch gear is also easy to understand and operate, and seems to be of good quality. While the T100 may look old school from the outside, on the inside, it is cleverly hiding it’s modern features under the body. 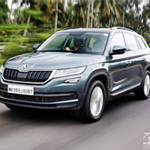 It comes equipped with Ride by Wire, Switchable Traction control system, ABS, liquid cooling, Engine immobilizer, and a under seat USB port for charging your necessary electronics. At Rs. 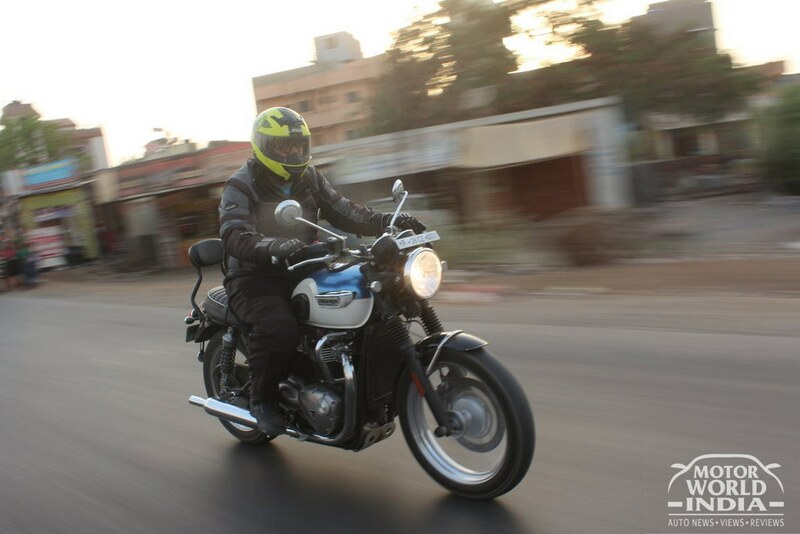 7,78,000/-, the Bonneville T100 is definitely worth the price paid. 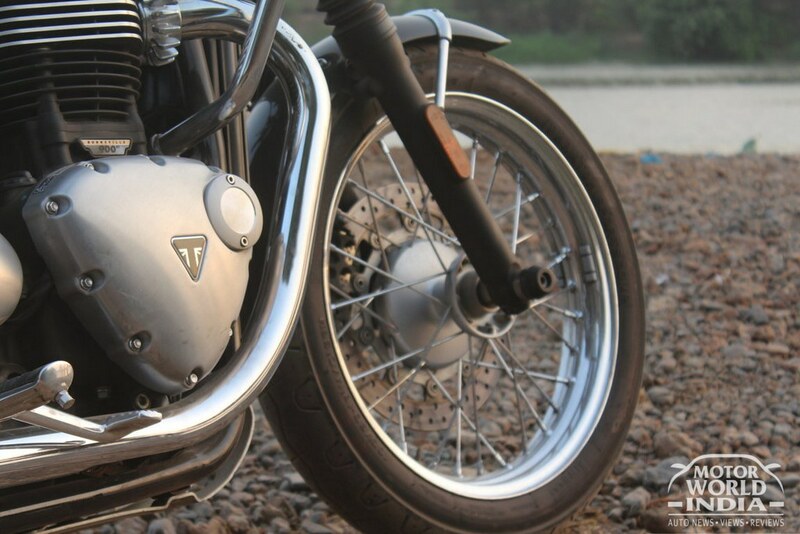 The T100 has its own old school aura around it, and the loyalists would surely love its originality and classic looks. It is for those who love cruising, for those who want to enjoy the beautiful landscapes and vistas of nature. It’s agile, easy to manouevre, silky smooth, impressively fast and delivers a Authentic Bonneville performance. 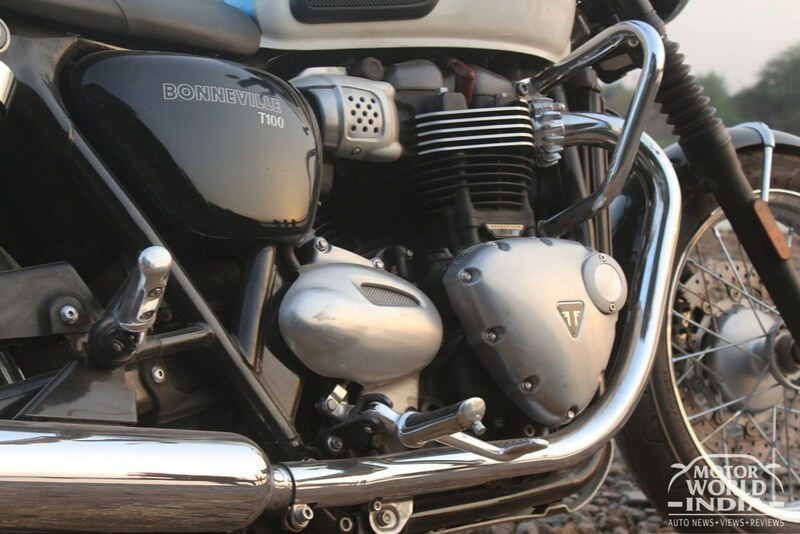 The Bonneville T100 surely gets added to my ‘Dream Garage’ without any second thoughts!